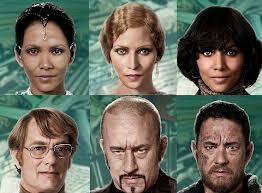 I don’t suggest seeing Cloud Atlas unless you are in a particularly open-minded state and willing to be confused. For three hours. The collaboration between the directors (the Wachowskis of Matrix fame and Tom Tykwer, known for Run Lola Run) is a mash-up of six story lines spanning centuries with a few connecting threads here and there. The filmmakers use the same famous group of actors each six times, sometimes as different races, sometimes aged and sometimes just unrecognizable. They featured Tom Hanks, Halle Berry, Hugh Grant, and Hugo Weaving who is so good at being creepy. To make Cloud Atlas digestible, some physical elements transcend the timelines, like music and letters, even a movie clip. These things appear and reappear in a few of the segments to provide a sort of track to follow. Also present across the centuries is the delicate balance suggested between the damnable slave trade of the past and the post-apocalyptic humanoid issues of the future. Clear echoes exist, and while I understand why the Cloud Atlas filmmakers would want to demonstrate the story’s grand scale interconnectedness of humanity’s past mistakes and successes shedding light on and playing into its future, they do not make this revelation particularly fun to sit through. The muddled language of the future sounds an awful lot like mocking slave-speak from the 1800s. Tom Hanks, wonderful though he is, cannot be understood in his opening monologue. You begin Cloud Atlas straining to understand a futurized gibberish. Then you get to figure out why these actors are playing such completely different people in the interweaving of the six-story lines (all of which you see in few-minute increments interspersed through the film). Visually, the sequences set prior to 2012 are neat little historical models. Scenes of the sci-fi future are as original as a computer can imagine, with a little post-apocalyptic island dwelling, complete with cannibals, tossed in for good measure. And a green ghost demon. What movie is complete without one? There are parts of Cloud Atlas just about anyone could find unsavory. I would be hard-pressed not to acknowledge the sheer scale of the movie, but I really don’t think a great deal of the general population is going to love it. Cloud Atlas is epic, to be sure, but that doesn’t always make a movie good. It seemed like it would be ideal for the big screen, and thus reason to drop $60 on a movie night. I checked Rotten Tomatoes and it got a 63% – not bad, but far short of Argo’s 95%. Then again, many people did not like John Carter (Disney) and that was an excellent movie to me. You’ve got me torn. I may still see it, perhaps on a matinée.